You've watched Tiger Woods and Phil Mickelson on television — you know the brand of golf balls they use. And they're good, right? You should be able to use the same brand of golf balls and be good too, right? Maybe using the same type golf balls as the PGA golf pros will improve your game . . . and maybe it won't. You need to choose the golf ball that's right for your own game. Choosing the wrong kind of golf ball can be a bigger handicap to your game than starting at the 19th hole. Choosing the right kind of golf ball can have you feeling like a Tiger, even if you don't quite have his handicap. Golf balls come in three styles: 2-piece, 3-piece, and high performance. 2-piece golf balls are designed for improving your distance, while 3-piece and high performance golf balls can typically help with accuracy. The 2-piece golf balls are especially good if you're just starting out or if you've played just enough to know you really want to give this sport a try. They're also terrific for high handicap golfers who have been around a while. Hey, we can't all be pros! These are the most common type on the market and usually less expensive than 3-piece balls. Best of all, the large rubber core provides faster speed off the tee for those of you with a slow swing. In turn, that gives you greater distance. It could happen that the first time you played, everyone was astounded at the way you slammed that little white ball with the power of a major league batter aiming for a grand slam. But that's doubtful. Distance is usually developed over time as you develop your swing and find the groove. When you are just beginning, chances are you need to improve your accuracy more than your distance. Once you've developed your accuracy, then is the time to choose a golf ball and clubs that will help improve your distance. If you haven't developed consistent accuracy — that is, having the ball consistently land in the same "general" area each time — then the 3-piece golf ball probably isn't right for you. It's just not as forgiving of miss-hits as the 2-piece golf ball. The same goes for high performance balls. They're pretty much designed for advanced golfers . . . and their price bears this out. One factor to always be considered is cost. Simple, standard 2-piece golf balls usually come in 18-packs and are relatively inexpensive. The cost of golf balls may seem small in comparison to the overall cost of pursuing the sport but the inexperienced golfer can go through a lot of golf balls in a very short space of time! 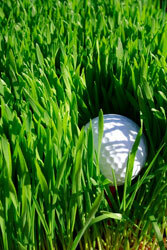 The key, as with most golf equipment, is to choose the right kind of golf ball for your level of play. Consider your swing and your game, and then choose the ball that will help eliminate your weaknesses and build upon your strengths. If you don't choose the right golf ball for your level of play, your golf round might just become what Mark Twain once called it: ". . . a pleasant walk, spoiled".